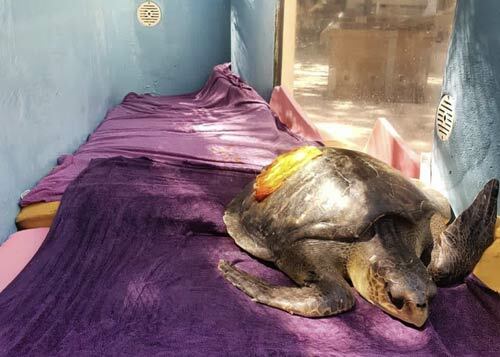 Lulu was a sub-adult olive ridley turtle and the victim of a boat strike. She came to us via Marine Savers and has severe cracks in her shell. 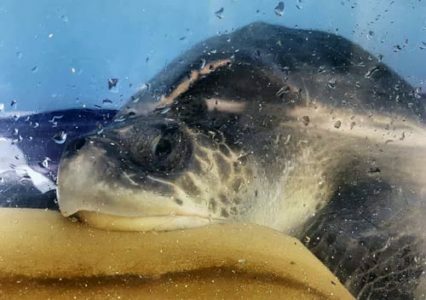 Due to the cracks in her shell, Lulu could not be submerged in water. We therefore have converted one of our tanks to a padded dry dock for her! Before we could repair her shell, we first needed to ensure that she was free from infection. We hoped that her shell would heal itself whilst we treated her wounds. With the arrival of our ultrasound machine we were able to do more diagnostics. We discovered a huge amount of infection and fluid inside Lulu’s lung and shell. We then performed surgery, draining 1.7 litres of pus from her lung. Unfortunately, her right lung was past the point of recovering and she had a huge amount of infection and dead tissue inside. We did our best to try and flush out the infection, however, it was too late by the time she came to us. We tried hard to save her, placing a feeding tube into her stomach and putting her on I.V. fluids. but sadly she passed away 25 days after arriving.